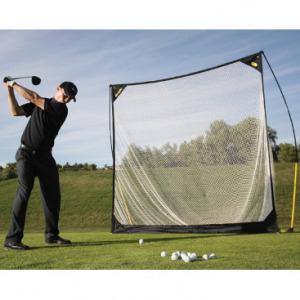 The Sklz Quickster 8' Golf Net is the largest of the ultra-portable, quick-assembly golf nets from Sklz Golf. The large coverage space and included golf target allows golfers to practice all types of swings without needing a range or course to do so. If you have any questions regarding the Sklz Quickster 8'x8' Golf Net with Target, please give us a call, we would be happy to help you with any questions you may have. Write an online review on the Sklz Quickster 8'x8' Golf Net with Target, and share your thoughts with others.